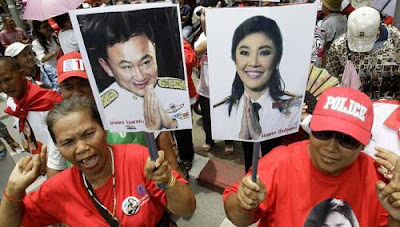 BANGKOK (AP) - As she marks a year in office this week as Thailand's first female prime minister, Ms Yingluck Shinawatra's biggest boast could be about what hasn't happened during that time: a return to the chaos that has wracked the country for much of the past six years. Her achievement is all the more remarkable because she is the sister of the man at the center of Thailand's long-running political maelstrom, former Prime Minister Thaksin Shinawatra, who was deposed by a military coup in 2006 after being accused of corruption and disrespect for King Bhumibol Adulyadej. "From being a novice, this is a woman who has come a long way already in one year, but there's much further for her to go for her to achieve her government's objectives," said Bangkok's Chulalongkorn University political science professor Thitinan Pongsudhirak. "And she's also a long way from the sort of compromise and reconciliation that this country needs."